Q. Our company uses Excel 2013 running on Windows, but one of our employees wants to switch to a Mac. If we allow him to do this, will his Mac-based Excel files be compatible with the rest of our office’s Windows users, and are there any specific differences between Excel for Mac and Excel for Windows? A. Generally speaking, Excel versions for Mac and Windows are reasonably compatible. 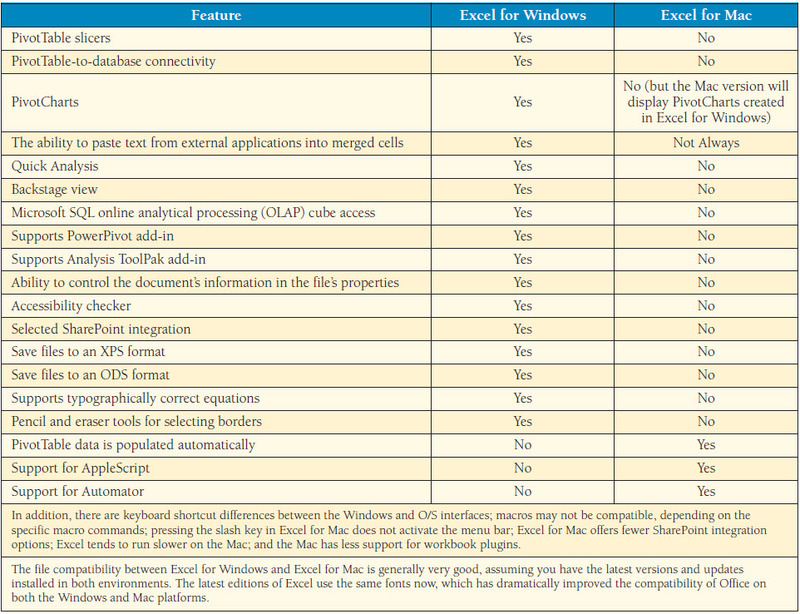 The table below summarizes the primary functional differences between the Mac and Windows editions of Excel. To overcome those differences, some Mac owners run Excel for Windows through a virtual machine solution called Parallels Desktop 10 (parallels.com) ($79.99), which then allows users to purchase and run Windows (starting at $99.99) on their Macs. Similar virtual machine solutions include Apple’s Boot Camp Windows (tinyurl.com/plu4hye) (free); and VMWare Fusion 7 (vmware.com) ($69.99).